If Brandon Bostick catches the ball, the game is over and the Packers are going to the Super Bowl. If he follows his assignment and blocks, then MAYBE Jordy Nelson catches the ball and the Packers go to the Super Bowl. That play is likely to haunt him forever. Fans and critics will blame him, but it should have never gotten that far. How many times have I written that phrase in reference to the Giants or the Red Sox? Two teams legendary for letting big games slip away, so Packers fans I speak from experience, when I say, please don’t blame Brandon Bostick. The Giants lost a playoff game in similar fashion back in 1997, and it was all Chris Calloway’s fault. It was the Wild Card round against the Vikings. I was spared the agony of watching this game, because my boyfriend (now husband) had bought us tickets to see West Side Story at the Providence Performing Arts Center for Christmas (he didn’t know me as well back then). I missed a playoff game to go (I must have really liked him). I have a vivid memory of the ball bouncing off Calloway’s chest that I must have seen on a highlight. So we blame Calloway. We still blame Calloway, but the Packers mess on Sunday got me thinking, did the Giants have a chance to put the game away well before the onside kick? It took some digging on the interwebs, but this is what I learned thanks to Today in Pro Football History and Philly.com. Remember, I was watching the Jets and the Sharks, but my father confirms that this is how it went down. The Vikings like the Seahawks were plagued by turnovers early in the game and the Giants built a 19-3 lead by halftime. They like the Packers did not put the game out of reach when they had the chance—a lot of field goals—but still they had control of the game. With just over two minutes to play, the Giants had a 9-point lead and the ball, and they went three and out and were forced to punt. The kick wasn’t deep and the Vikings led by Randall Cunningham (curse you, Randall Cunningham) scored a touchdown cutting the Giants lead to two points. Then came the kick. Calloway was sent in as part of the hands team and he dropped it. The rest is history. The Vikings completed the biggest comeback by a NFL road team in the postseason since 1972 and won their first playoff game in nine years. The Giants excited the playoffs empty handed. The Packers certainly could have scored more points much earlier in the game, but that’s not why they lost. Brandon Bostick is not why they lost. The Packers lost that game, because they had the ball with 5:13 to go and played like they had already won. Morgan Burnett could have kept running after the interception. You only give yourself up when a few kneel downs will win you the game not with five minutes left and only a 12-point lead against the defending champions. Mike McCarthy could have called a play that could have actually gotten them the first down instead of three totally predictable rushes in a row, and Eddie Lacy could have run forwards. The defense needed to come up with one more stop and they couldn’t. When you play not to lose, you often do, especially when you are playing a team like the Seahawks. But if only Brandon Bostick had caught the ball! If only Calloway had! It should not have gotten that far. Also, please stop saying he “Bucknered” it. An onside kick is not the same as a routine ground ball (sorry Bill). Our New York Football Giants are bad. Really bad. Amazingly bad. Can you even remember the last time they were this bad? For the record, Dave Brown was sacked 148 times in 54 games between 1994 and 1997 (thank you, Pro-Football-Reference.com). That’s almost three times per game. Eli has been sacked 14 times in four games this season, which is an average of 3.5 times per game. Yeah, that’s worse. On top of that, when the Giants played poorly, back in the day, I seem to remember it being the offense letting the defense down or vice versa. I cannot remember a time when they were this bad across the board. The offense is bad, the defense is bad and special teams are bad too. Yet, they have talent. That’s what makes this season so frustrating and mystifying. Eli Manning is not Dave Brown (no offense Dave Brown) and Tom Coughlin is not and never will be Ray Handley (take all the offense you want Ray Handley). They’ve had injures, sure, but still it’s no excuse for how bad they have played. The funny thing is, the Giants are far from out of it. If they beat the Eagles on Sunday and Dallas loses to Peyton Manning and the Broncos, then the Giants would finish the day only one game back in the division. It’s crazy, but they could still do this. And if they don’t, at least we have the Red Sox. Let’s take a moment to appreciate our 2013 Boston Red Sox and the magical season they have put together, before our battle against the Rays in the American League Division Series begins. 97 wins! After losing 93 games last year, could you have ever imagined a turn around like this? No matter what happens, this season has been incredible, and I give much of the credit to John Farrell and the great job Ben Cherington did building this team. However, I’m not going to lie; the Rays scare me, more than any other team remaining. They’re scrappy, they have good pitching and they don’t like us. They may also have momentum on their side, and, of course, there is the history: the ALCS in 2008 and Game 162 in 2011. Those are difficult memories to erase. If we had our choice of opponents, we probably would not have gone with the Rays. Losing to them will be painful. On the other hand, beating them will feel so good (so good, so good). If the Red Sox can pull this off, and I think they can, then revenge, sweet, sweet revenge will be ours. What would make it even better is, if David Ortiz hits the go-ahead, eventual winning home run in Game 3 right off that smug “162 Landing” sign in left field. I don’t think the Red Sox see this series as revenge though. Unlike me, they have moved on. That’s the beauty of this team. They have put all the badness from 2011 and 2012 behind them. They play to win the game at hand and don’t worry about anything else. It’s clear; the Red Sox give us our greatest chance at happiness this year–sorry Giants. Although, it’s still too early to rule them out. Funny how things go, two years ago, the Giants were hoisting the Lombardi Trophy and the Red Sox were trying to rebound from one of the worst collapses in sports history. Today, the Sox are on the verge of something very special and the Giants are circling the drain only four weeks into what could have been a good, if not great season. I guess the lesson here is that not every year can be 2007. And for your continued reading pleasure, check out this New York Times article I found on Ray Handley from December of 1991. Hockey can be a cruel sport. Last second or overtime goals can be as painful as a punch in the stomach for both the players and the fans. Walk off homers, final second field goals, and amazing buzzer beaters can certainly knock the wind out of you, but hockey is different. Something about it makes it worse. It’s a function of the pace and scoring difficulty. Baseball has the bottom of the ninth. Not to mention all the time in between pitches. Football has time outs, the two-minute warning and one hundred yards between goal lines. Basketball’s pace is similar to hockey, but when is the last time you saw a basketball game that ended with a 3-2 score. Hockey is unique. There’s no time to breathe. There’s no sending your opponent to the foul line in moments of desperation. You can’t intentionally walk a strong player to get to a weaker one. You can’t run the clock out by kneeling down. If you could, the Bruins’ hopes of a seventh Stanley Cup would likely still be alive. It’s been a while since I have experienced such a loss as a fan. In the past decade, the Red Sox are two for two in the World Series. The Giants are also perfect in Super Bowl chances having defeated the Patriots twice. The Bruins won in 2011 and the LA Kings won last year. The Celtics won it all in 2008, and when they lost in 2010 it was to the Lakers—have I never mentioned that I’m a Lakers fan? That’s a different story for a different day. It’s been a pretty spectacular ride for me, when you really think about it. Of course, there was Andy Roddick’s loss to Roger Federer at Wimbledon in 2009. That match certainly took the wind out of my sails for the rest of the day. There was also the “Best Play in NFL History”—please don’t get my started on that—but DeSean Jackson’s punt return did deliver a blow similar to two goals in 17 seconds. The closest fan experience, for me at least, was probably Sidney Crosby’s overtime goal in the Vancouver Olympics, which ended the USA’s dreams of gold. That game, although soul crushing, was what got me into hockey. The disappointment from the loss didn’t prevent me from recognizing the brilliance of the game, and a hockey fan was born that day. My appreciation and knowledge of the sport has grown since. Someday soon I may even understand the icing rules. Although, I have to admit I’m afraid of falling in love with it. If the Red Sox or Giants had been out there on that ice and suffered a loss like that, I would have likely gone into hiding for days or weeks or had a heart attack long ago. Hockey is not for the meek. Losing can be excruciating—just ask Toronto—but doesn’t that make winning all that much sweeter. I have to tip my cap to the Blackhawks. They played an incredible game and series. To the Bruins, thank you. You lifted us up when we needed you the most. You provided us with a truly thrilling distraction. We didn’t need you to win it all, we just needed you to keep playing. We needed the hope of winning for as long as possible. You gave us that, and we will be forever grateful. It was moving to see, hear actually, the fans at the Garden chanting, “Let’s go Bruins,” after the game and the Cup had been lost. It would have been an awesome moment to be a part of. See what you have done Bruins, you have turned me into a hockey fan, for life I fear, but for this I am thankful…I think. And for anyone who is clamoring, “What about soccer?” When they cut the field in half, we can talk. After eight years of managing from the other side, it must be a little weird for the former Red Sox skipper to be back at Fenway with his new team, the first place Cleveland Indians. Luckily his return comes two years after The Collapse and his subsequent “dismissal”. If he had come back as a manger last season, while the Red Sox were still suffering under Bobby Valentine, things could have gotten ugly–for Valentine. Chants of “We want Tito” would have echoed through Fenway Park; while tonight, we are more likely to hear a simple “Tito, Tito” to show respect for the man who brought us two World Championships. Word on the street is that the Red Sox have planned a special video tribute to honor Francona. The standing ovation that will follow will likely rival the reception he received at the 100 Years of Fenway celebration. The applause won’t end there. When Francona makes his first trip to the mound, I fully expect the place to go nuts. Hopefully, he’ll go back to the right dugout. If this had happened a year ago, I wouldn’t have been surprised if fans stormed the field and dragged Francona back to the Red Sox dugout; politely explaining to Bobby V, of course, that he was out and Terry was in. Today, the circumstances are a bit different. The Red Sox are well above .500 and just a half game out of first. Farrell has done a wonderful job of turning around a sorry, last place ball club. He is the right man to lead this team into the future, so when fans cheer for Francona–and they will cheer loudly and often–Farrell should not take offense. Of course, the current Red Sox manager had a front row seat for some of the Francona magic. He understands what Terry means to the fans. The man ended The Curse after all. That is how Tito will be remembered. Not for The Collapse. Those memories will fade and be replaced by new ones–hopefully a championship or two under Farrell. Francona’s legacy will forever be entwined with ending the 86 year draught and for that he will always be welcomed with open arms in Boston. Welcome home Tito. And in case we haven’t said it enough already, thank you. As a fan of the New York Giants, I often get mistaken for a Yankee fan. I’ll be wearing a Giants hat or one of my jerseys, and someone with a Yankees hat on will walk by me and nod. When this happens all I want to do is scream, “I am not a Yankee fan!” I am actually offended that this person could think that I—a Rhode Islander and devout Red Sox fan—would ever stoop so low as to root for the New York Yankees. This week, I feel differently. 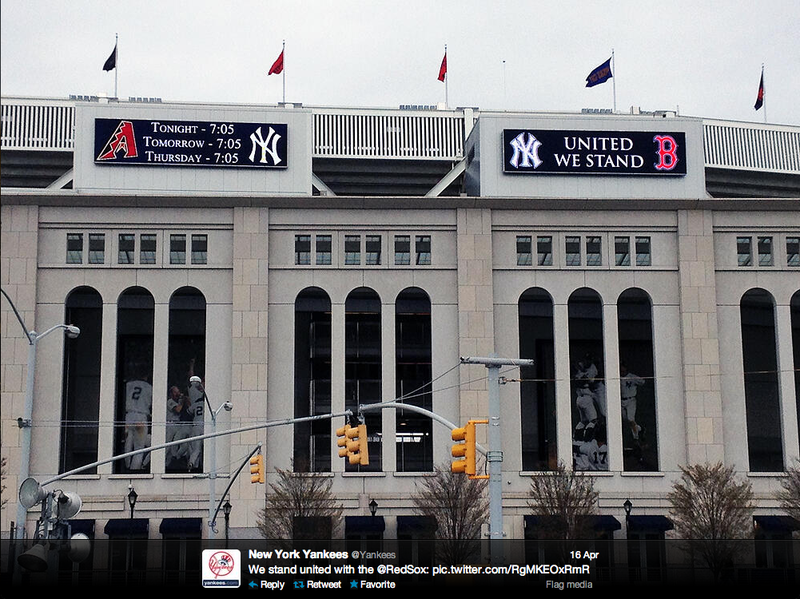 In the wake of the horrific and devastating terrorist attacks in Boston, the outpouring of support from other baseball teams and cities across the country has been truly touching. A day after the bombings at the Boston Marathon, Cleveland Indians fans, who certainly have plenty of reasons not to like the Red Sox, waved signs that said, “Pray for Boston,” as they sat through a long game on a cold, damp night at Progressive Field. “Sweet Caroline” was played in stadiums from Los Angeles to Miami to Chicago. It brought tears to my eyes. It was an act that seems small but means so much. Terrorists want to divide us but their cowardly acts only serve to bring us closer together, and this is proof. The New York Yankees put a big red “B” on the side of The House that Steinbrenner Built. The team that would mercilessly chant “1918” at us when we were down is now in our corner. This is what makes sports and our country great. We may play or root for different teams, but we are all in this together. When the chips are down, we have each other’s backs. At the end of the day, we may say that we hate each other, but deep down inside we know that the game of baseball that we love so much would not be as great without the other. Thank you, Yankees. Thank you, for your support. Thank you, to every team and fan that has kept the great people of Boston in their thoughts and prayers. Rest assured that the city of Boston will only emerge from this tragedy stronger than it was before. Now, don’t worry Red Sox Nation, we can go back to “hating” the Yankees eventually, but I wonder what the atmosphere will be like when New York plays its first game at Fenway in mid-July. I’m sure players and fans will want to show their gratitude, perhaps with a few friendly smiles or tips of the cap. Maybe even with some applause—at the very least, less booing. One thing is for sure, the next time a Yankee fan nods at me, I will gladly and proudly return the gesture. As the manhunt continues for the second suspect, my heart is with the people of Massachusetts. Red Sox Great Start: Is It Too Early To Jump On Bandwagon? Our Boston Red Sox are looking a lot better than many of us thought they would. Last year at this time, the panic meter was almost in the red. This year, the needle is swinging in the opposite direction, but are we at risk of getting too ahead of ourselves? Cautious optimism is certainly the best approach with 155 games left to be played. While my gut tells me this team will continue to play well, Monday’s game did highlight two areas of concern. First and foremost, where in the world has the offense been against left-handers? On Sunday, the Sox touched up the reigning NL Cy Young winner, right-hander R.A. Dickey, for eight runs in four and two thirds innings in route to a 13-0 victory. One day later, Orioles left-hander Wei-Yin Chen held the Red Sox scoreless through six innings, allowing only four hits until Daniel Nava’s towering three-run shot over the Monster. Chen hasn’t been the only southpaw to stifle the otherwise potent Red Sox offense. J.A. Happ pitched a one-hitter through five, leading the Blue Jays to a 5-0 win on Saturday, and Andy Pettitte allowed just one run and eight hits over as many innings in our only other loss this season. The one exception was Opening Day, when the Sox ended CC Sabathia’s outing early, but their overall lack of production against lefties is troubling and baffling. With a predominantly right-handed lineup, the laws of physics seem to have abandoned the Red Sox. Hopefully, they’ll find their groove in the coming weeks. The closer games are the more dependent the Sox will be on closer Joel Hanrahan. The former Pirate has logged three saves thus far but not without some drama. He surrendered a home run to Adam Jones with no outs in Monday’s home opener and has allowed the tying run to come to the plate in two out of his three save opportunities. Nothing can kill momentum quite like a blown save, but if he can keep the heat and the saves coming, Hanrahan can make games as interesting as he wants. After Papelbon, we’re used to it anyway. It’s been a while since the Red Sox have given us anything to be excited about, and I’m finding it hard not to jump feet first onto the bandwagon. Who am I kidding, despite these issues, I’m feeling pretty good about our chances. Still, I will do my best to remain cautiously optimistic. It’s never a bad plan when our Red Sox are concerned.